With an absence of new programme announcements from the big two Bombardier seized the limelight to show off not one, but two C Series aircraft for the first time at a public air show, supported by newly installed President of its Commercial Division, Fred Cromer. 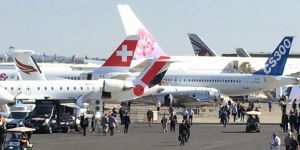 Swiss International, with 30 of the smaller 110-seat C3100s on order (originally from Lufthansa) showed an aircraft in its colours in the static park, announcing that 10 aircraft from its order will be for the CS300 135-seater. It may also change others for the bigger version by the end of 2016, CEO Harry Hohmeister said. The 10 CSJ100s will be received in 2016, so beginning a phase out programme of the venerable Avro RJ100s. Business aviation was more prominent this year – making up for the fact that many big name defence companies – BAE Systems, Saab, Northrop Grumman even Finmeccanica with their large dome product showcase, were absent. Dassault had a strong presence (as well as a very welcoming press centre) including the first showing of its new Falcon 8X in the flying display, just six months after it was rolled out of its Bordeaux-Merignac facility. VistaJet boss Thomas Flohr, who was only at EBACE for a few hours before flying back to agree a new bond issue for the company, called in to announce that this month he would take delivery of the company’s 50th Bombardier business jet – a Global 6000. He attributed VistaJet’s success in part to being loyal to one type and the great relationship they enjoy with Bombardier. Ruling out following others in merging he said that VistaJet would remain independent. The market was very fragmented in the aircraft management sector prompting this activity but VistaJet buys its own aircraft. There was a theme of established programmes getting a new lease of life too. The USA’s Sierra Nevada Corporation with its newly acquired subsidiary 328 Support Services of Germany and type certificate holder of the Dornier 328 (turboprop and jet) confirmed plans to resurrect the aircraft in Turkey under a new company called TRJet. In a deal with the Turkish Government and prominent Turkish aerospace companies ambitions extend to a new clean design TRJ628 in the 50 to 70-seat range – ready for 2023. “There is a sweet spot in the market now for his sort of aircraft,” said 328 Support Services Group Chief Executive Dave Jackson with some 5,000 aging aircraft that will need replacing in the 30 to 50-seat sector, complemented by additional demand from special mission and government versions. He advised it is close to an initial order for 50 TRJ328 jets initially from Turkey. The goal is build and deliver the first Turkish built TRJ328 in 18-36 months. The 328 Jet was (and still is) a very pleasant aircraft to fly in. 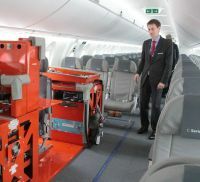 With ATR focused on the lATR72, it announced its first higher density version with 78 slimline seats (with a 28 inch seat pitch) with a 16-strong order from launch customer Cebu Pacific of the Philippines, the new complementary offering is set to be attractive proposition, especially if the low oil prices hold. ATR is still eager to persuade 50% shareholder Airbus (Alenia Aermacchi is the other partner) to approve a 90-seat version, but there was no news on that at Paris. It is sticking with its prediction for a further 2,500 turboprops in the next 20 years. Announcing an order from Japan Air Commuter for new ATR42-600s the number of ATRs sold to date has reached 1,500. There were two other refreshed programmes in the 18/19-seat category and showing on the static. RUAG, like 328-based at Oberphaffenhofen, near Munich, has teamed with new Indian sub-contractor Tata to build the 228-212 under license. Eight NG 228s have been built to date by RUAG with aerostructures supplied by HAL. RUAG cites demand in the19-seat market – from start-up airline operators, maritime policing and special mission too. Canada’s Viking Air showed off its new modernised Twin Otter 400 in Scotland colours (see BTN 15 June), one of two now operated by the country’s longest serving regional airline Loganair. Viking won a significant order for 50 aircraft from China during the show – from Beijing’s Reignwood Aviation Group. The OEM is confident it could sell up to 500 aircraft in China in the next 20 years. The Twin Otter DHC6 first flew on 20 May 1965. It is planning some celebrations around Canada to mark this historic milestone with a 50th Anniversary Celebration Tour starting in July. Even though the show seemed quieter than previous years airlines and leasing companies still racked up orders for 1,223 aircraft worth around US$69m. Highlights included Garuda’s MOU for 30 Dreamliners; 30 737 MAXs and an LOI for 30 A350 XWBs. Qatar Airways with its biggest presence ever at the show with five aircraft on the static – A320; A350; 787, A319 and A380 – signed for 10 777-8Xs and four 777 freighters. CEO Al Baker also threatened he would leave the oneworld alliance if the ongoing subsidies dispute between the Gulf carriers and three US carriers is not resolved – reiterating remarks made at the IATA AGM earlier this month in Miami. 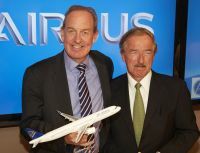 Air Astana CEO and President Peter Foster announced a deal with Air Lease Corp for seven new Airbus A320/A321 neo aircraft – including becoming launch customer for the A321neo LR. One A320neo will arrive in 2016 while the remainder follow in 2018 and 2019. Embraer bolstered its order book for the new E2 with a 50-strong commitment from new leasing company Air Castle, plus 17 E-190s to Colorful Guizhou from China. US carriers SkyWest and United confirmed orders for eight and 28 E175s respectively. Sukhoi’s SuperJet announced an order with Russian carrier Yakutia for three more SSJ100s for delivery in 2017 and with Airbus on the ATR programmes, while Mitsibushi announced its first Mitsubishi Regional Jet would make its maiden flight in September/October. 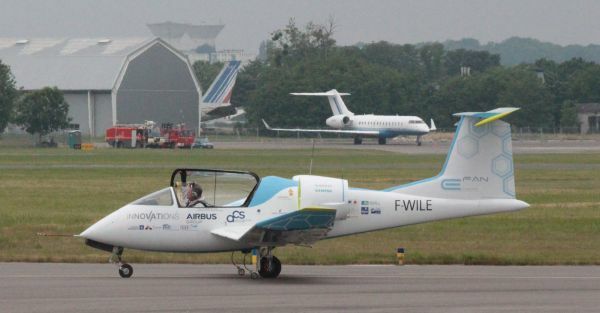 Special thanks to Rockwell Collins, Thales, 328/Sierra Nevada, Bombardier, Dassault and Aeroports de Paris whose hospitality made the Paris Show more enjoyable. See also Boeing 747 orders in this issue. 1,223 aircraft for USD69m - must be the greatest bargain air show ever? Talk about cheap - or should it be \'cheep\'?